China has had little respite. Gregor provides one well supported alternative, and he is carefully attentive to the implications of this alternative. It could easily have been anticipated. But few would agree with the central thesis of this book that the People's Republic of China (PRC) is best classified by scholars and responded to by Western policy- makers as "a variant of contemporary fascism" (p. 166). China has endured a century of turmoil, beginning with the anti-dynastic revolution associated with Sun Yat-Sen, through the military and tutelary rule of Chiang Kai-shek, the revolutionary regime of Mao Zedong, and the radical reforms of Deng Xiaoping. China has had little respite. Historians and social scientists have attempted to understand some of this history as being the consequence of the impact of European ideologies-including Marxism, Marxism-Leninism, and Fascism. 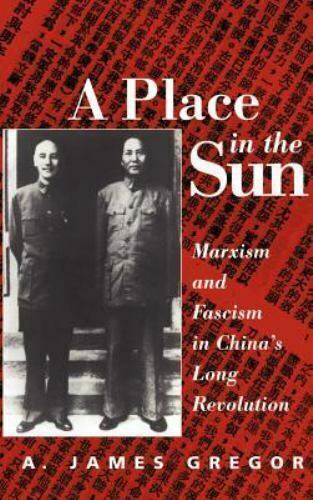 Rarely instructive or persuasive, the discussions regarding this issue have, more often than not, led to puzzlement, rather than enlightenment.In A Place in the Sun, A. James Gregor offers an interpretation of the role of European Marxist and Fascist ideas on China's revolutionaries that is both original, and based on a lifetime of scholarship devoted to revolutionary ideologies. Gregor renders a detailed analysis of their respective influence on major protagonists. In the exposition, Gregor reveals an unsuspected and complex set of relationships between the Chinese revolution and essentially European ideologies. His discussion concludes with a number of estimations that suggest implications for the future of modern China, and its relationship with the advanced industrial democracies. How post-Dengist China-the world's most populous nation-is to be understood remains uncertain to most comparativists and historians. Gregor provides one well supported alternative, and he is carefully attentive to the implications of this alternative. While many sinologists assume that Marxism and Fascism played some indeterminate role in China's Long Revolution, in this text, A. James Gregor attempts a detailed analysis of their respective influence on major protagonists.